Louisville Public Schools is designated as Cass County District 32. 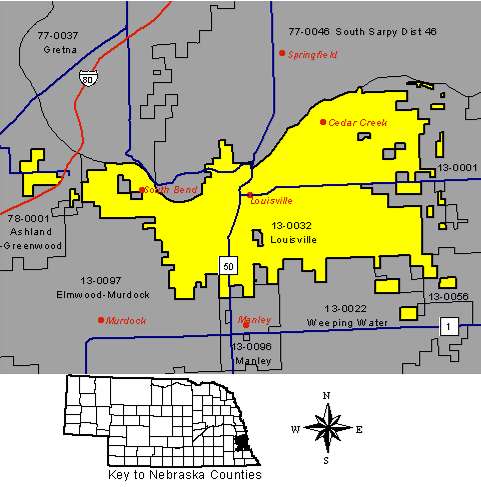 The district comprises 66.2 miles located in Cass and Sarpy Counties. Louisville, Cedar Creek, South Bend and portions of Manley are the towns that are located within the district. Louisville Schools is classified as a Class III district by the Nebraska Dept. of Education; and a Class C-2 school by the Nebraska School Activities Association. Louisville Schools is a member of the East Central Nebraska Conference.